Car parking lot that used to be a building. 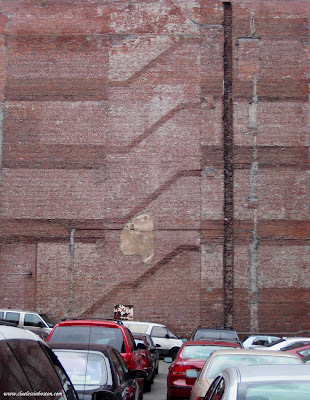 You can see on the brick wall the imprint of the stairway and floors from the building that is now gone. I have always been intrigued with these "shadows" from the past that are still visible in the present. And how long before the parking lot becomes another high rise office building or luxury condominium? I liked the title of this post very much--and also your observations about things that are no longer there save for traces of their existence...very nice. Oh, I really like this photo, Clueless. I also find these remnants interesting--I've noticed a good many in Portland but not when I've been able to take a photo. You've inspired me to remedy that at some point. Thanks! Yea! Boston Red Sox! Yea! I don't think I'd like parking there. Looks like no one can get out, and if someone has to get your car out, it may take awhile.